Early locomotives were called “the iron horse”. The analogy of steam engines was used to describe the horse’s respiratory (and circulatory) system is pretty apt. Think of the horse’s food (hay and grain) as the fuel that propels the horse’s “engine”. Like the steam engine, the fuel is converted into nutritional energy (like the locomotive’s steam) that powers the horse’s muscles. The horse’s respiratory system (lungs) provides much needed oxygen to assist with metabolism, while the circulatory system (heart) delivers the oxygen and nutrients to the tissues. It also provides a way to carry off the waste products (most commonly carbon dioxide) created when the horse’s “engine” is running/ On the simplest level, the respiratory system acts like an air exchange – oxygen comes in and carbon dioxide goes out. 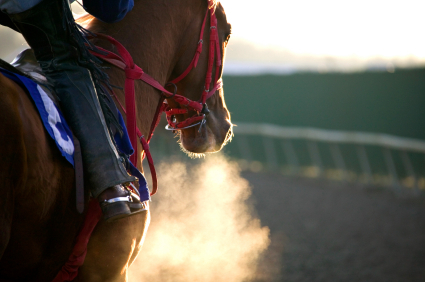 Air comes in through the horse’s nostrils and travels along the horse’s long nasal cavity. The benefit of the horse’s long nose is that it has time to warm the air before it reaches the horse’s lungs. It then passes through the trachea to tiny tree-like passageways (bronchus) in the horse’s lungs. These bronchi further branch out to alveoli where the air exchange occurs. At the same time, the circulatory system is bringing oxygen and delivering it to tissues throughout the body, along with nutrients absorbed during the digestive process. The amount of oxygen required and the amount of carbon dioxide waste produced will vary with the amount of exercise the horse is performing. More oxygen is needed and more carbon dioxide is produced during strenuous exercise than it does when the horse is standing in its stall. It is this increased process of air exchange that caused a horse to have a faster respiration rate. The heart itself is divided into two halves and each half has two chambers (atrium and ventricle). The right atrium and ventricle pump blood into the lungs, where it is loaded with oxygen. The oxygen-laden blood returns to the left side of the heart, where the left atrium and ventricle then pump it throughout the body. While all of the systems of the horse must work together, the horse’s respiratory and circulatory system have a special symbiotic relationship. Both sides must work equally well for the horse to remain happy and healthy. It is therefore important that your horse receive the recommended shots to prevent such diseases as influenza, strangles and rhinopneumonitis. In addition, use good barn management practices to be sure to provide horses with plenty of clean, fresh air. Classic Equine Equipment offers a variety of stall systems, barn doors and barn windows that will help provide your horse with air circulation. 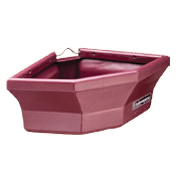 Using Classic Equine Equipment’s grain and hay feeders will help keep food off the ground and at a recommended eating height to avoid either ingestion of non-food particles from the ground or inhaling hay particles from hanging hay net, both of which can cause lung issues. For more information on designing your barn to meet your horse’s needs, request a FREE catalog!